Mascara separates and defines each lash for a naturally expressive look. The formulation combines mineral pigments with nourishing ingredients such as eyebright and beeswax to soothe and protect delicate lashes. Ingredients: Water, Alcohol, Sorbitol, Castor Seed Oil, Cetearyl Alcohol, Camellia Sinensis Leaf Extract, Melia Azadirachta Leaf Extract, Hectorite, Euphrasia Officinalis Extract, Hydrogenated Jojoba Oil, Beeswax , Rosa Damascena Flower Wax, Fragrance (Parfum)*, Citronellol*, Geraniol*, Linalool*, Xanthan Gum, Lysolecithin, Potassium Hydroxide, Silica, Iron Oxides (CI 77499), Titanium Dioxide (CI 77891), Ultramarines (CI 77007). 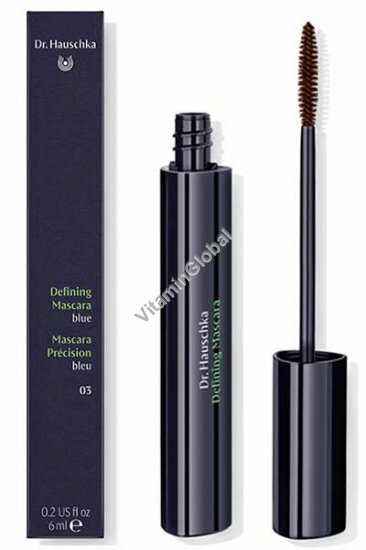 Usage: Apply evenly to the lashes from root to tip.